Herculaneum Tour Guide – Archaeological tours for tourists, lovers and scholars in the main archaeological sites buried by the Mount Vesuvius in the 79 AD. The small italic town with a grid patter town planning, first introduced by the Greek architect Ippodamus from Miletus (6th century BC), is located at the foot of Mt Vesuvius and just 4 miles south from Naples. Dionigi from Alicarnasso says that the town had Greek origins, founded by Hercules, after coming back from Hiberia, whereas Strabo speaks about the Oscan origins. Around the VI century BC it belonged to the Nucerina Confederation, then conquered by Silla in 89 BC becoming a colony of the Roman Empire, and taking the status of a municipium. It soon became the favorite place for rich and cultured Romans, thanks to its climate and to its natural beauties. The town was quite small, as the total area within the enclosure was of 20 hectares with an estimated population of 4,000. The earthquake of 62 AD had damaged it, and then was violently affected by the 79 AD eruption that covered it under a tick layer of about 15-30 meters of mudslide and pyroclastic material. 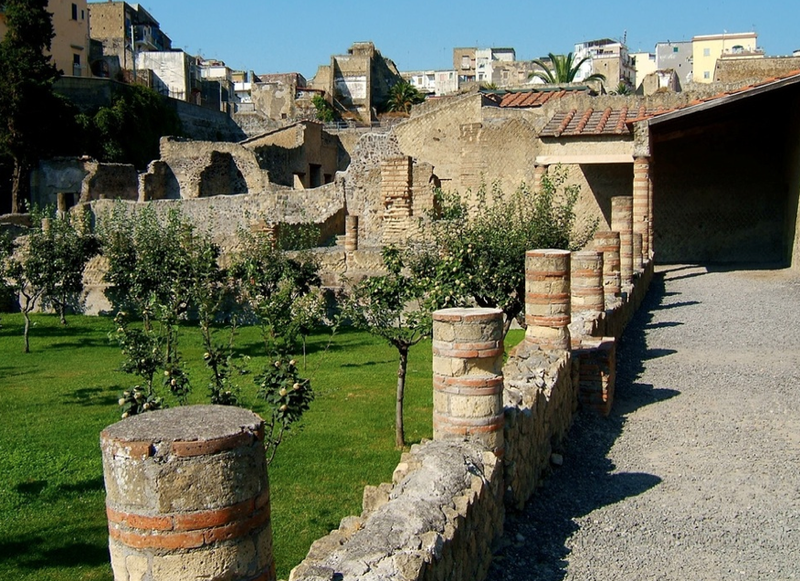 The town of Resina had developed on the top of the ancient Herculaneum. The city was lost until the XVIII century, when the finds from Roman times, when the Herculaneum theatre was brought to light. Emanuel-Maurice from Lorena, prince of Elboeuf and commander of the Austrian army, whose villa had been built near Portici’s harbor, was informed of the discovery and started the excavation at his own expenses. Systematic excavations started in the year 1738, because of the king Charles III of Bourbon, man with a great culture and love for the archaeology. The excavations had been led by the engineer Rocque Joaquin de Alcubierre who made the first efforts to bring the city to light. The excavation technique involved the creation of underground passages that once the finds were taken out, it got covered again. This pioneering work is considered as the first example of archaeological excavations, and stimulated the birth of archaeology. The discovery of Villa dei Papiri in 1750 increased attention towards Herculaneum’s excavations at that time directed by the Swiss military engineer Karl Weber, and then in 1764 by Francesco La Vega who was also a military engineer. In 1780 the works were interrupted and concentrated in Pompeii mainly because of easier type of excavations due to different volcanic burial phenomena. The technique of building underground passages and wells was interrupted in 1828, when open-air excavations were permitted and carried out until 1875. After a long interruption, the works started again in 1927 with Amedeo Mauri, who directed them until 1958; in 1942 almost the whole area that is part of what today represents the archaeological area had already been brought to light. Between 1960 and 1969 more works were carried out in the Northern area of Insula VI and along the Decumano maggiore, and in the last two decades of the last century the beach located in the Southern point of the archaeological area was explored. This is where have been found 12 rooms with arched entrances used as sheds for boats and where more then 300 inhabitants looked for shelter, running away from the eruption. Among the buildings brought to light we have to remember the Theatre, found at a depth of 26 meters, that could host 3,000 people in 10 lines of steps; noble and luxurious villas mainly in the Southern quarter with balconies overlooking the sea and the gulf od Naples and among these the House of Deers, with a bright garden and spacious rooms with colored marble floors. Among the Public building we have to remember the Augustales Temple with opus sectile mosaics and wall paintings of the IV style. 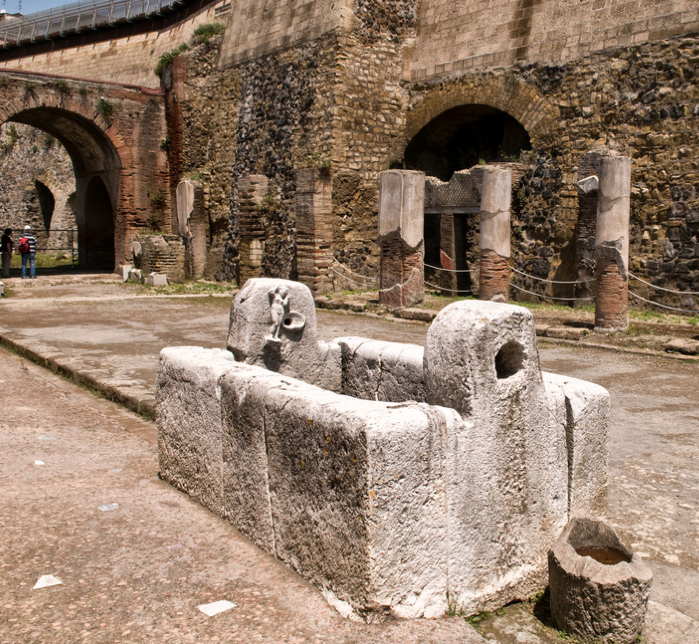 The excavated area of the town is 5 hectares, (Pompeii 40 hectares). Up to now we have two decumani (streets north-south) and three cardines (streets east-west), but we can assume the existence of at least two more cardines and one decumanus; the roads are paved with lava and, differently from Pompeii, they do not appear as used from cart wheels, presumably because of limited access due to narrow roads going downhill towards the sea. 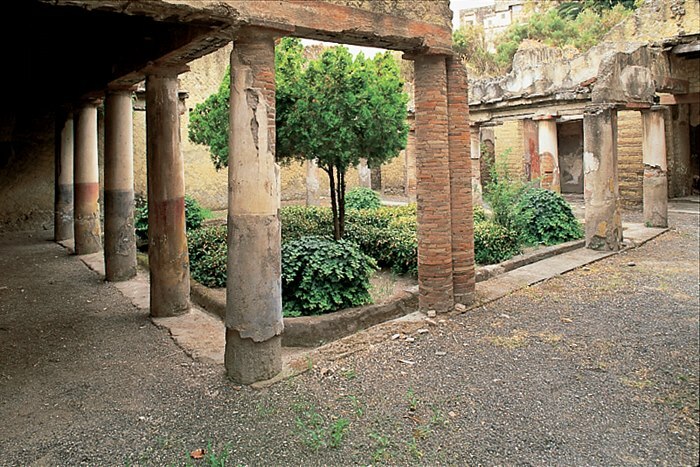 The buildings found in Herculaneum witness a variety of architecture a lot wider than the one found in Pompeii. The peculiar conditions of burial had provided a better defense against thieves and the atmospheric agents, helping the preservation of walls, wooden parts and food providing a unique glimpse into the private lives of Romans.